When you're the same brother of a schizophrenic identical twin, the tricky thing about saving yourself is the blood it leaves on your bands--the little inconvenience of the look-alike corpse at your feet. And if you're into both survival of the fittest and being your brother's keeper--if you've promised your dying mother--then say so long to sleep and hello to the middle of the night. Grab a book or a beer. Get used to Letterman's gap-toothed smile of the absurd, or the view of the bedroom ceiling, or the influence of random selection. Take it from a godless insomniac. Take it from the uncrazy twin--the guy who beat the biochemical rap. Born in the waning moments of 1949 and the opening minutes of 1950, the twins are physical mirror images who grow into separate yet connected entities: the seemingly strong and protective yet fearful Dominick, his mother's watchful "monkey"; and the seemingly weak and sweet yet noble Thomas, his mother's gentle "bunny." From childhood, Dominick fights for both separation and wholeness--and ultimately self-protection--in a house of fear dominated by Ray, a bully who abuses his power over these stepsons whose biological father is a mystery. I was still afraid of his anger but saw how he punished weakness--pounced on it. Out of self-preservation I hid my fear, Dominick confesses. As for Thomas, he just never knew how to play defense. He just didn't get it. But Dominick's talent for survival comes at an enormous cost, including the breakup of his marriage to the warm, beautiful Dessa, whom he still loves. And it will be put to the ultimate test when Thomas, a Bible-spouting zealot, commits an unthinkable act that threatens the tenuous balance of both his and Dominick's lives. To save himself, Dominick must confront not only the pain of his past but the dark secrets he has locked deep within himself, and the sins of his ancestors--a quest that will lead him beyond the confines of his blue-collar New England town to the volcanic foothills of Sicily 's Mount Etna, where his ambitious and vengefully proud grandfather and a namesake Domenico Tempesta, the sostegno del famiglia, was born. Each of the stories Ma told us about Papa reinforced the message that he was the boss, that he ruled the roost, that what he said went. Searching for answers, Dominick turns to the whispers of the dead, to the pages of his grandfather's handwritten memoir, The History of Domenico Onofrio Tempesta, a Great Man from Humble Beginnings. Rendered with touches of magic realism, Domenico's fablelike tale--in which monkeys enchant and religious statues weep--becomes the old man's confession--an unwitting legacy of contrition that reveals the truth's of Domenico's life, Dominick learns that power, wrongly used, defeats the oppressor as well as the oppressed, and now, picking through the humble shards of his deconstructed life, he will search for the courage and love to forgive, to expiate his and his ancestors' transgressions, and finally to rebuild himself beyond the haunted shadow of his twin. Set against the vivid panoply of twentieth-century America and filled with richly drawn, memorable characters, this deeply moving and thoroughly satisfying novel brings to light humanity's deepest needs and fears, our aloneness, our desire for love and acceptance, our struggle to survive at all costs. 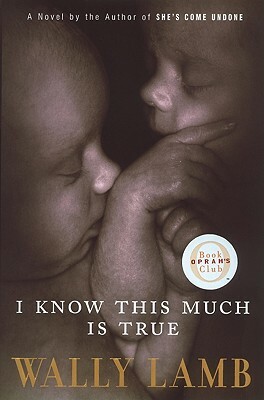 Joyous, mystical, and exquisitely written, I Know This Much Is True is an extraordinary reading experience that will leave no reader untouched.